An Australian study published today has found that certain baby sharks are able to cope with the level of ocean acidification predicted for the end of this century. Dr. Jodie Rummer from the ARC Centre of Excellence for Coral Reef Studies (Coral CoE) at James Cook University (JCU) and her co-authors studied epaulette shark embryos as they were developing. “Overall, there were no differences between growth and survival in sharks reared under current day conditions versus those reared under ocean acidification conditions predicted for the year 2100,” Dr. Rummer said. However, she also conveys caution. Shark gills play an important role in helping correct pH disturbances—the team thinks that the risk of death under ocean acidification conditions may be highest before the embryo’s gills are fully developed. “This is when the embryos may be most vulnerable. So, future projections are still not the best-case scenario for the sharks,” Dr. Rummer explained. Those that got past this stage though, were able to carry on with business as usual. Epaulette shark eggs normally incubate for 3–4 months before they hatch. Over the course of the study, the researchers raised epaulette shark eggs from 10 days after they were laid until 30 days after they hatched. During this time, the sharks were raised in one of two groups: today’s current ocean conditions or conditions meant to simulate ocean acidification predicted for the year 2100. The researchers counted gill and tail movements of the developing embryos. They measured how much yolk the embryo was consuming and how much the embryo was growing. And, upon hatching, they further monitored survival and growth. Carbon dioxide emissions into the atmosphere have been increasing dramatically since the industrial revolution. The oceans are absorbing approximately 30% of this carbon dioxide, causing ocean acidification. By the year 2100, it is predicted that the ocean’s acidity will have increased by 150% since pre-industrial times. This is worrying particularly for calcifying organisms, such as corals and other marine animals with a shell: more acidic waters limit their ability to produce shells. However, little is known about how non-calcifying marine species, such as sharks, will fare. Sharks, rays, and skates (elasmobranchs) are considered some of the most vulnerable of all marine vertebrates—currently, nearly a quarter of all elasmobranch species are threatened by extinction. While some marine species can simply move when their environmental conditions become challenging, smaller species often do not have that luxury because of their size and/or risk of becoming another predator’s dinner. In these cases many small species use structures such as coral reefs for shelter. However, in these small hiding places, water quality conditions can become even more challenging. Eggs, especially, cannot move if environmental conditions become unfavourable. The egg case also does not shelter the embryo from changes in water chemistry. 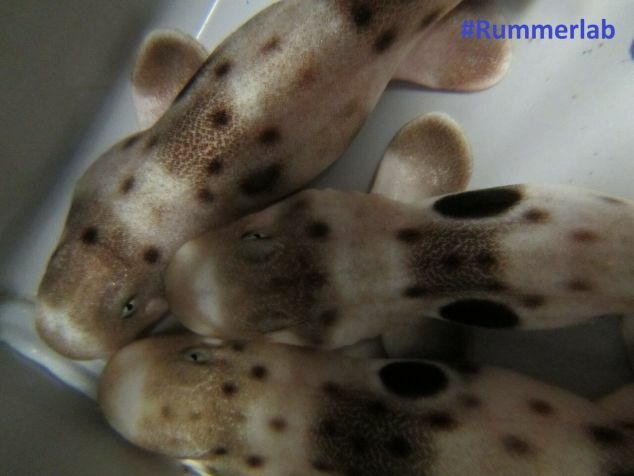 Dr. Rummer says that recent studies from her group suggest adult epaulette sharks, after prolonged exposure to high carbon dioxide to simulate ocean acidification, are not affected physiologically in terms of metabolic performance, or behaviourally in terms of food finding and shelter seeking. Her team thinks the reason behind this is that they are adapted to the fluctuating oxygen and carbon dioxide conditions in their hiding places. “Therefore, if these sharks are able to tolerate challenging conditions as adults, they must also be able to early in life, and maybe even more so!” she said. However, she warns that while this sounds like great news for this species, ocean acidification is predicted to pose huge challenges for reef-building corals that provide such critical habitat and shelter for this small shark. Will ocean acidification affect the early ontogeny of a tropical oviparous elasmobranch (Hemiscyllium ocellatum)? by Martijn S. Johnson, Daniel W. Kraver, Gillian M. C. Renshaw, and Jodie L. Rummer appears in Conservation Physiology, March 2016.